Chef D. Brad Coleman, CC, ASTCA is a native of Erie, Pennsylvania in the United States. He is an American Culinary Federation Certified Chef. Chef D. Brad Coleman, CC, ASTCA is a native of Erie, Pennsylvania in the United States. Brad graduated from Hickory High School in Hickory, NC. He attended Pennsylvania Culinary in Pittsburgh, PA and is an American Culinary Federation Certified Chef. 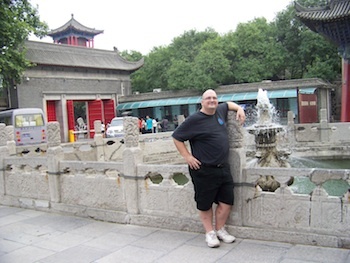 Brad first started visiting China in the Summer of 2003 to work in a Summer Camp type program teaching English to Students in the City of Xi’an in Shaanxi Province. He returned in 2004 with the same program, and then visited the nation of Kazakhstan in November / December 2005. In July of 2006, Brad moved to Xinzheng City, Zhengzhou in Henan Province to work at SIAS International University. As his contract was nearing it’s end in 2007, Brad felt he wanted to continue working in China, and so accepted a position as Sous Chef and Training Manager with Blue Horizon Hospitality Group in Shanghai. In January of 2008, Brad returned to Zhengzhou City and began his work there. In 2010, Chef Brad went to Chongqing City for 5 months before returning again to Zhengzhou, where he is working now. He is looking forward to his first summer home in 2 years this summer and a return to Zhengzhou in October 2011.